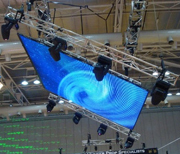 One of Australia’s leaders in lighting and exhibition rigging is Clifton Productions. It’s no surprise that as a leader in the industry, Clifton looked to Stagemaker when they required a new set of chain hoists that could meet their high safety standard and technically particular requirements. Clifton Productions required hoists which were quiet, light weight and had to have an IP rating of 54. The Stagemaker hoists were the perfect job being one of the very few brands in the world to meet these requirements and even more. With Stagemaker being the leading hoist brand throughout Europe, all of their hoists meet stringent European safety standards which are far higher than those currently enforced in Australia. Read the full article in Group Technologies.